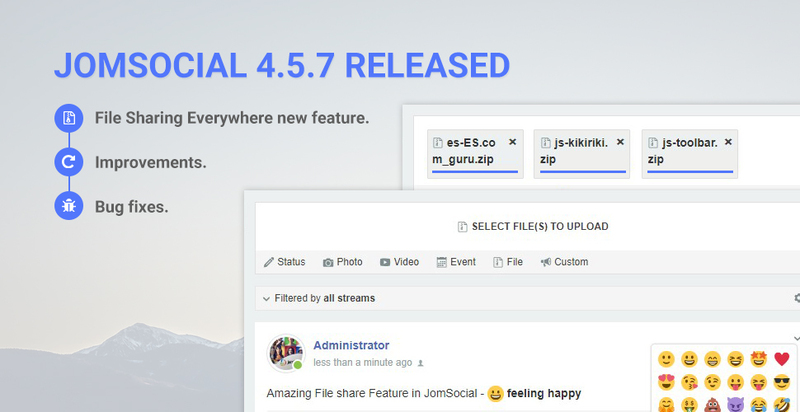 We are happy to announce a new release for Joomla community extension: Jomsocial 4.5.7 with the major feature of file sharing everywhere in wall streams. The file sharing feature supports frontpage, groups and events status updates. The new version also includes improvements and 10+ bug fixes. JomSocial allows developer to submit their add-ons built for JomSocial on JomSocial add-ons page. 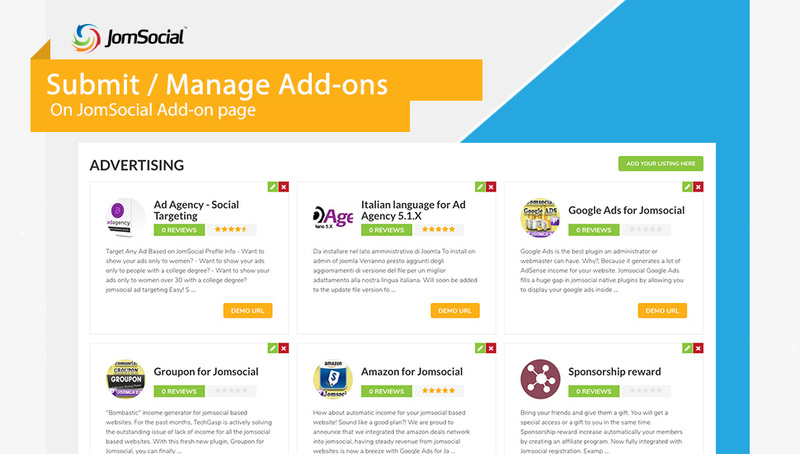 This blog post shows you step by step to add and manage your add-on on JomSocial add-on page. 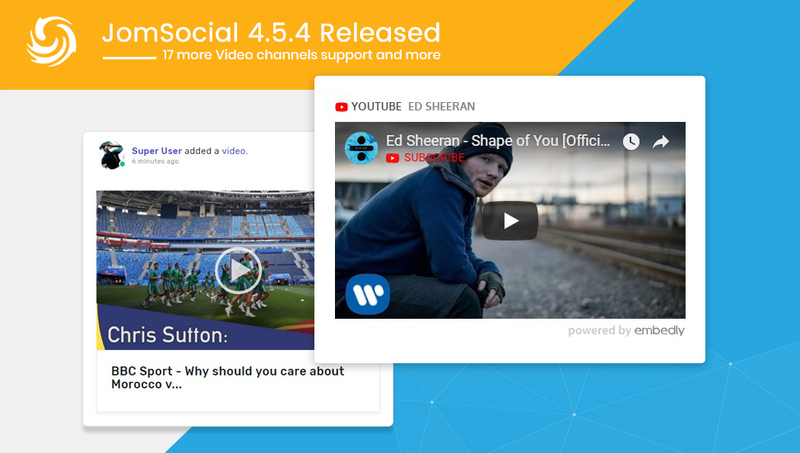 Last week we released the Jomsocial 4.5.4 version for 17 more popular video channels support and improvements. 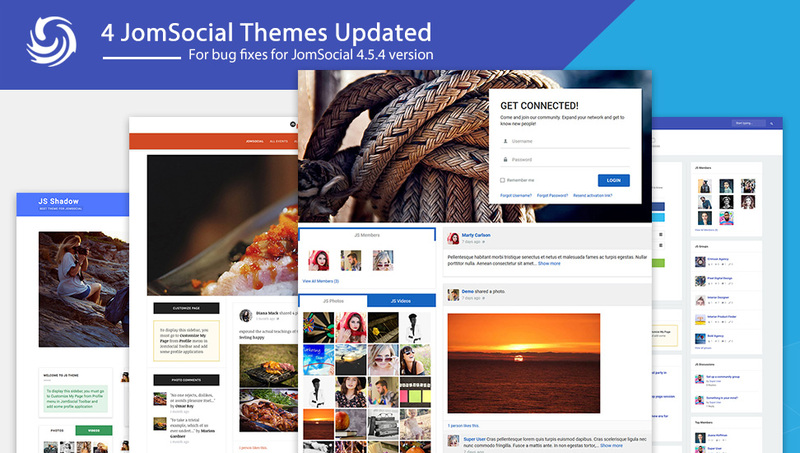 Today, JomSocial team are releasing important updates for 4 JomSocial themes: JS Kikiriki, JS Shadow, JS Column and JS Flat for JomSocial 4.5.4 style compatibility, bug fixes and improvements. In the previous preview blog post for Jomsocial 4.5.4, we shared the list of the new video providers and more improvements. 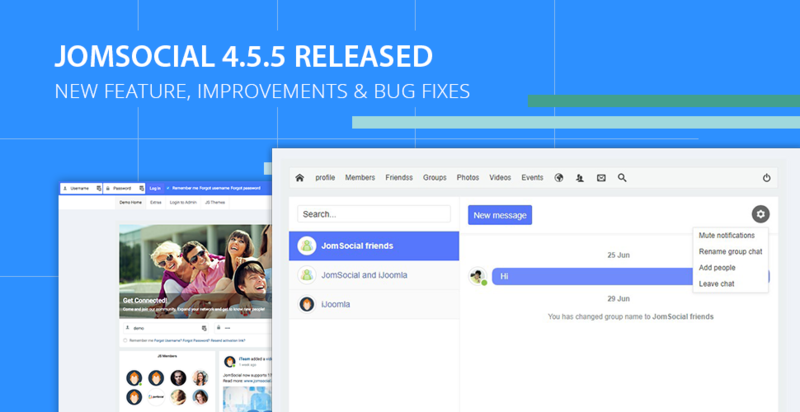 Today, we are happy to announce that JomSocial 4.5.4 is now available for download. This is a major release with 17 new video providers support, message and chat improvements, user data delete option for GDPR and bug fixes. We are releasing a quick release for Jomsocial 4.5.3 for General Data Protection Regulation consent checkbox. 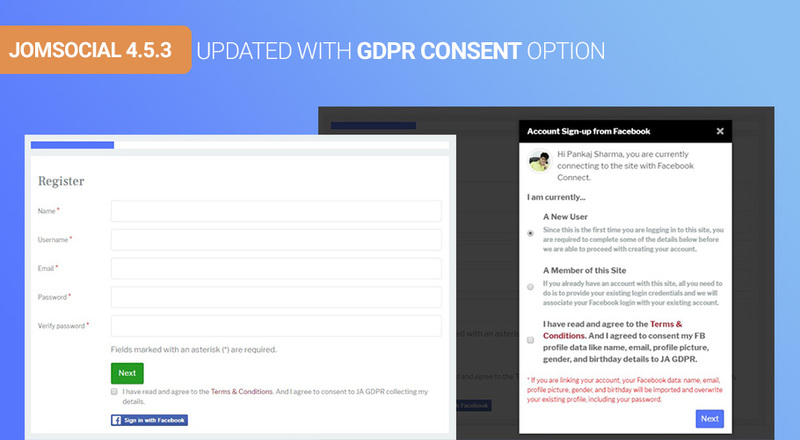 Since the General Data Protection Regulation is started from today and its required to site owners to give a clear consent option for users in the registration form during a new user singnup on site. 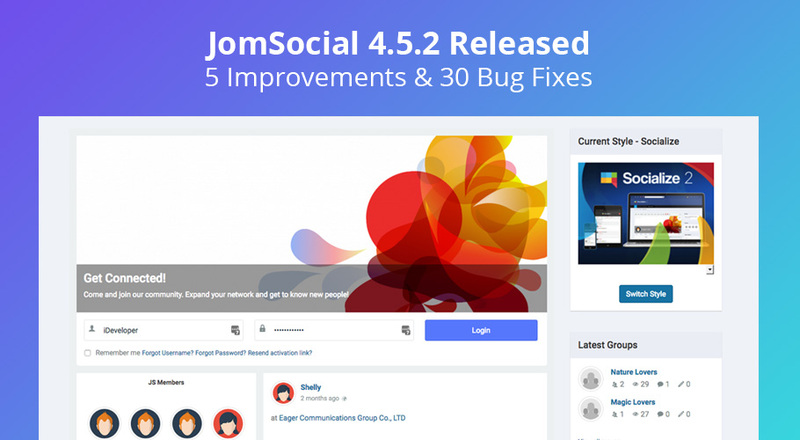 We are happy to announce JomSocial 4.5.2 release. 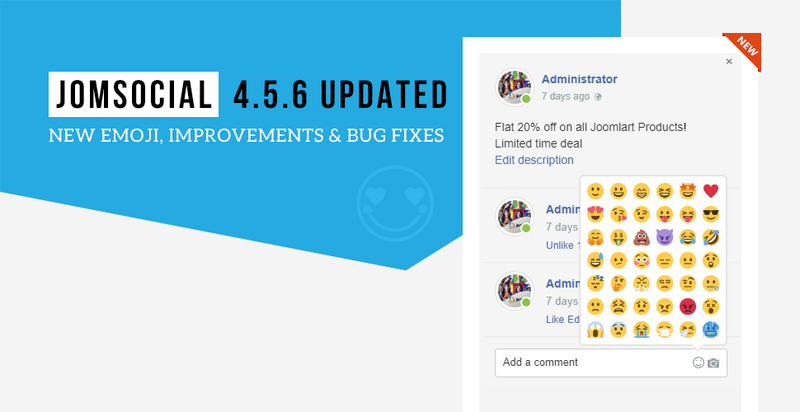 It is an important update release with improvements and bug fixes that are reported in the last version of Jomsocial. We would like to thank you for the positive feedback and bug reports in the 4.5.1. In this Jomsocial version 4.5.2 release, we have addressed some RTL layout issues and Improvements. We expect more improvements and new features in upcoming releases.